Author Tim Wise said on Monday's OutFront that the historical depiction of Jesus as white has resulted in slavery and genocide and "speaks to the entire history of white supremacy." "Here's the reality. The image of a white Jesus has been used to justify enslavement, conquest, colonialism, the genocide of indigenous peoples. There are literally millions of human beings whose lives have been snuffed out by people who conquered under the banner of a white god," Wise claimed. As NewsBusters reported yesterday, CNN guest Tim Wise accused the Supreme Court of racism, saying they "basically called 40 million black folks that [N-word] without saying it" through their rulings on the Voting Rights Act and affirmative action. Then on Tuesday night, Wise tried to sidestep his words and claim he didn't "exactly" say that, although he did "exactly" say that. "That was what a lot of white conservatives were attacking me for today, basically saying that I had, you know, essentially accused John Roberts of calling 40 million black folks the N-word. That's not exactly what I said," Wise argued on Tuesday's OutFront. On CNN's Monday night special "The N Word," guest Tim Wise claimed that the Supreme Court used that racial slur against all black Americans through its rulings on the Voting Rights Act and affirmative action. "I mean, the reality is, we have a Supreme Court that in the last ten days has just basically called 40 million black folks that word without saying it by restricting or limiting the Voting Rights Act of 1965 and basically ending for all intent and purpose or, at least, limiting in many ways, affirmative action," Wise insisted. "CNN Newsroom" host Don Lemon is miffed at the GOP -- and he let CNN Senior Political Editor Mark Preston know it on Sunday night. When Preston noted that since the Republicans are once again in the majority in the House of Representatives, they're going to have "to come up and they have learn how to govern," Lemon responded that "They have to learn how the answer the question. Because one person said, was talking about his run for president and the interviewer kept asking him, what are the specifics. Well, my family and I are going to take the Christmas time and pray. I wanted to throw stuff at the television." Mere moments before, Lemon indicated to Preston that he had watched every single Sunday morning talk show and "was so frustrated with these (Republican) guys. Like, why aren't they answering the questions." 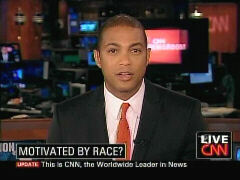 CNN's Don Lemon tossed softballs at leftist writer Tim Wise on Sunday's Newsroom, mostly reading back excerpts from his latest column, which the anchor labeled a "withering rebuke of...the 'white right.'" Lemon even twice emphasized how Wise has apparently received death threats over the column, where he slammed "conservative old white people [who] have pretty much always been the bad guys." 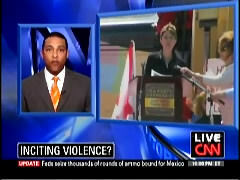 The CNN anchor interviewed Wise for nearly eight minutes during a segment 10 minutes into the 7 pm Eastern hour. Lemon began with "withering rebuke" label and continued that the author "begins with a disclaimer that he is not referring to all white people, and that his essay is not anti-white. He says it is addressed to- quote, 'The white community that is right-wing.'" He then turned to his guest and seemed to compliment him before asking his first question: "I was actually- I have to be honest- a little bit stunned when I read this because your language is unusually rough and raw. We know that you tell it like it is. You called the election results a temper tantrum and you sound mad as hell....do you regret using any of this fiery rhetoric?"